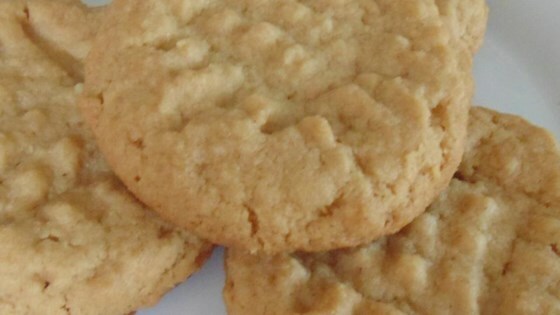 "Click here to find out why these are the 'peanutbutteriest' cookies ever! They are very crumbly, but well worth it for anyone who loves peanut butter. They are very crumbly, but very yummmmmy!!" In a large bowl, cream together the peanut butter, butter, and white sugar until smooth. Stir in the water and vanilla. Combine the flour and salt; stir into the peanut butter mixture. Drop by rounded spoonfuls onto an ungreased cookie sheet. Press down lightly using the tines of a fork. Bake for 10 to 15 minutes in the preheated oven. Let cookies cool completely before removing from baking sheets. You definetly need to bake these cookies for the full 15 minutes or they are fragile, but they are extremely tasty. A wonderful rich cookie.